Baby's Palate, Food Memories Shaped Before Birth Amniotic fluid and breast milk can be flavored by the food a mother eats. And memories of these flavors are formed before birth. That could result in preferences for these foods or odors for a lifetime. Want your child to love veggies? Start early. Very early. 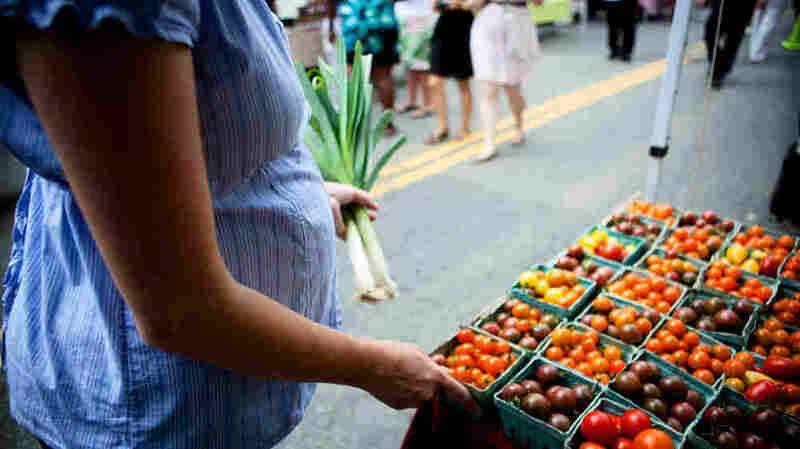 Research shows that what a woman eats during pregnancy not only nourishes her baby in the womb, but may shape food preferences later in life. At 21 weeks after conception, a developing baby weighs about as much as a can of Coke — and he or she can taste it, too. Still in the womb, the growing baby gulps down several ounces of amniotic fluid daily. That fluid surrounding the baby is actually flavored by the foods and beverages the mother has eaten in the last few hours. "Things like vanilla, carrot, garlic, anise, mint — these are some of the flavors that have been shown to be transmitted to amniotic fluid or mother's milk," says Julie Mennella, who studies taste in infants at the Monell Chemical Senses Center. In fact, Mennella says there isn't a single flavor they have found that doesn't show up in utero. Her work has been published in the journal Pediatrics. To determine if flavors are passed from the mother to the the baby via the amniotic fluid, researchers gave women garlic capsules or sugar capsules before taking a routine sample of their amniotic fluid — and then asked a panel of people to smell the samples. "And it was easy," says Mennella. "They could pick out the samples easily from the women who ate garlic." The sense of taste is actually 90-percent smell, she added, so they knew just from the odor that the babies could taste it. Mennella says she got the idea from dairy farmers, who in the 1960s and 70s were doing research on how the diet of the dairy cow impacted the flavor of the milk. She says cows that graze on wild garlic and onion, or who live in stinking barns, produce milk with distinct flavors. But Mennella says that not only is the amniotic fluid and breast milk in humans flavored by food just like cows, but memories of these flavors are formed even before birth. That could result in preferences for these foods or odors for a lifetime. In other words, if you eat broccoli while you're pregnant, there's a much better chance your baby will like broccoli. Mennella says this had already been observed in rabbits, so she decided to test it in human babies — with carrots. Pregnant women were divided into three groups. One group was asked to drink carrot juice every day during their pregnancy, another during breastfeeding and a third to avoid carrots completely. Then when the children began to eat solid food, researchers fed them cereal made either with water, or carrot juice and videotaped their responses. Things like vanilla, carrot, garlic, anise, mint — these are some of the flavors that have been shown to be transmitted to amniotic fluid or mother's milk. "And just like the European rabbit, the babies who had experienced carrot in amniotic fluid or mother's milk ate more of the carrot-flavored cereal," says Mennella. "And when we analyzed the video tapes they made less negative faces while eating it." This makes a lot of evolutionary sense, says Mennella. Since mothers tend to feed their children what they eat themselves, it is nature's way of introducing babies to the foods and flavors that they are likely to encounter in their family and their culture. "Each individual baby is having their own unique experience, it's changing from hour to hour, from day to day, from month to month," says Mennella. "As a stimulus it's providing so much information to that baby about who they are as a family and what are the foods their family enjoys and appreciates." That very idea got Matty Lau thinking 'how is it that kids in other cultures eat foods that are spicy, bitter, or have pungent flavors?' She's a Chinese-American who had a baby in late July and recalls growing up eating foods most American kids she knows would never touch. "My parents are great cooks — and so they'll cook things like preserved oysters. I always wondered how it was that I was able to grow up eating bitter vegetables like kale and mustard greens and things like ginger," says Lau. While she was pregnant, she consciously tried to provide her baby with the flavors she loves from her native Chinese cuisine. She the hopes that when her baby is older, it will share her love of flavorful food. "I was really concerned that my child enjoy food as much as the rest of my family," says Lau. University of Florida taste researcher Linda Bartoshuk says babies are born with very few hard and fast taste preferences. She says Mennella's work shows that very early exposures to flavors – both before and after birth — make it more likely that children will accept a wide variety of flavors. And when those early exposures are reinforced over a lifetime, Bartoshuk thinks they might have far-reaching implications, even promoting good eating. "To what extent can we make a baby eat a healthier diet by exposing it to all the right flavors — broccoli, carrots, lima beans, et cetera? Could we do that or not? My guess is we could," says Bartoshuk. Menella acknowledges that many toddlers will still make a sour face when given broccoli, no matter how much the mother ate while pregnant. And maybe they will never like it. But she says parents should keep exposing young children to these flavors because they can eventually learn to like them.